More Pictures at the bottom of this item description. You can see a lot of detailed pictures at the bottom of this item description. Ti ringrazio per il tuo interesse. Se tu non sai bene l'inglese, cioe' non capisci bene la descrizione di sotto, non esitare a chiedermi qualsiasi domanda in italiano!! Parlo io italiano (ma non molto bene), quindi provo di risponderti nella lingua vostra/ in italiano!! Mad Cat guitar is famous for having been played by Prince in his early years. Mad Cat was originally designed and made by a Japanese manufacture, Moridaira (Gakki). This guitar is one of them. Bill Lawrence guitars are currently made in Korea but in 80s and 90s they were made in a Morris factory in Japan. Bill Brother's brand was introduced several years after Bill Lawrence. Most of Bill Brother's guitars were made in Korea but some of them such as Excellent Series were made in Japan. Moridaira is a Japanese musical instrument company that introduced Gibson & Fender to Japan in 60s and the current importers/distributors of Moog, Paiste, Orange, and so on. Moridaira's house brand of guitars is Morris. Morris has been manufacturing acoustic guitars since 1967 and they also made electric guitars from the 70's and 90's. There are cracks near the neck pocket as often seen on bolt on neck jointed guitars. The neck joint plate seems to have been replaced because no serial number is punched on it. It stated that the guitar model name was BMC-30. The serial number was also printed on it. I took the picture of the card so if you want to see it, please contact me and I will send it as an attachment. The last two digits of the serial number in the pictures is hidden for the sake of the next owner. Regarding the manufacturing country, I believe that the item is made in Japan, but I don't have any official certification so please judge if it is so (or not) for yourself by seeing all the pictures or by info on the internet and so on. 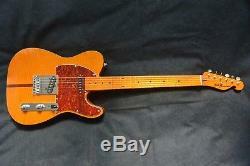 Specs Body: looks Maple + Alder + Maple Neck: Maple Neck shape: not slim but not chunky. Neck width at nut: approx. 43.5 mm / 1.73 in. 3.75 kg / 8.267 lb. Scale: 648 mm / 25.5 in. The specs above are extracted from the catalog or are based on my research, so they could be misinformed or mistaken. The weight and the neck width are based on actual measurement. Condition of the item Please refer to the photos &. Section below regarding guitar condition. The neck looks straight and the truss rod works fine. The fretboard is smooth and fine. The frets show minimal wear for its age. Or at least they might have a slight scratchy sound which can removed by a contact cleaner. There might have been shallow paint cracks, especially near the neck pocket as often happens with bolt-on neck guitars. Please check them by the pictures. Almost all of the guitars in my store are not a brand new, but a used one, so they are not always be in "PERFECT" condition. This can be especially true of "VINTAGE" guitars that have had many years of use and because of this they can sometimes have issues with playability, so for many reasons they may need care and maintenance before reaching an optimal playing condition. Nowadays a lot of guitar players know the term "JV" (Japan Vintage) and that the values of guitars made in and around the JV era are getting higher. However, in Japan, there is a significant humidity difference through the year which can have a bad influence on the materials in guitars if they are not well kept & carefully maintained. Sometimes they are stored away for ages after a very short period of use, as a result it is often the case that they have issue's about the neck. I have played guitar for many years and all the guitars in my store were listed only after I checked & played them personally. All of the guitars in my store passed the normal standards/my standards unless particularly stated otherwise. However that does not mean "perfect" condition as most guitars in the world have some issue be it a scratch or a break. As the guitars are used the frets are worn more or less. I cannot say 70% or 80% left or something like that,,,,, because who can count the degree in a precise way? So please check the degree by the pictures. If the guitar needs refreting or if there is any defect with the frets (judging by my standards) it will be stated in the description. I check the Fret (String) Buzz by picking normally with light gauge strings (009-046), adjusting the bottom string height (low E) to 2.0 / 2.5 mm and the top string height (high E) to 1.8 / 2.2 mm. The bottom string height/E to 2.8 / 3.3 mm and the top string height/G to 2.3 / 2.8 mm. The guitars are used, so slight buzz could occur. If the fret buzz of the guitar is above the normal standard, the detail is described in the description of the guitar. As the guitars are used, they might have a number of dents, scratches, blemishes, chips and so on. Unless they are in mint or near mint condition, you cannot describe all of them, so please judge the condition by the pictures. ALL the electrical parts work fine unless there is a particular fault in which case it will be mentioned in the description, but they might have a slight scratchy sound. Please check the guitar within two days of it being delivered to you. If it differs significantly from the description I will accept the return. , Guam, Hong Kong, India, Indonesia, Korea Rep. , Malaysia, Saipan, Singapore, Taiwan, Thailand and so on. Such as United States, Canada, Mexico. Such as Australia, New Zealan. Such as United Arab Emirates, Israel, Qatar, Saudi Arabia, Syria, Turkey, Bahrain, Cyprus, Jordan, Kuwait. Such as Austria, Belarus, Belgium, Bulgaria, Czech, Croatia, Denmark, Estonia, Finland, France, Germany, Greece, Hungary, Iceland, Ireland, Italy, Latvia, Liechtenstein, Lithuania, Luxembourg, Malta, Netherlands, Norway, Poland, Portugal, Romania, Russia, Slovak, Slovenia, Spain, Sweden Switzerland, Ukraine, United Kingdom. Some countries and some regions are not covered by EMS. The rate is dependent on the combined weight of the items. Thanks a lot for looking and good luck! The item "BILL LAWRENCE MAD CAT TELE NEAR MINT PRINCE MADE IN JAPAN VINTAGE SUPER RARE" is in sale since Tuesday, April 24, 2018. This item is in the category "Musical Instruments & Gear\Guitars & Basses\Electric Guitars". The seller is "solemettere" and is located in Kanagawa. This item can be shipped worldwide.